In the PS4 game Darksiders 3 you can unlock a total of 569 trophies (incl. DLC Trophies). In this Trophy Guide we show you all the trophies and their tasks. 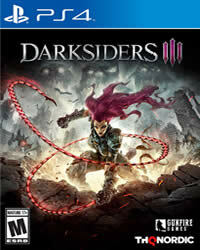 More Guides and News about Darksiders 3 you will find on our overview page. Play the game on APOCALYPTIC difficulty. The difference between simple and apocalyptic is actually not that big. You take more damage and the bosses have more health. You have complete control over how difficult it will be to push your character. As you increase your health and damage, apocalypticism is no more difficult than easy. You should absolutely, as quickly as possible, collect 50 attribute points. Farm the enemies at the Maker's forge, let yourself die and the enemies reappear. Anyway, you need 50 attribute points for the trophy "Big Spender". You can do this early and have a overpowered character, then you can pass all enemies and the bosses will be easy to defeat. For Whom The Bell Tolls – During the “Lust” boss fight. Only defeat Lust, ignore the second boss. Demon Meddler – After getting the Stasis Hollow, kill Abraxis. A Parting Gift – After killing Abraxis, return to the Lord of Hollows and choose to Spare him. Unlock all other trophies to receive the Platinum Trophy. Earn all other trophies in Darksiders 3 to unlock Platinum. Weapons are upgraded in the Markers Forge. Speak with Ulthain and choose a weapon upgrade. You need to upgrade your weapons with Adamantine Sliver, Adamantine Fragments, and Piece’s of Adamantine to level nine. For the final level, level 10, you need Chunk of Adamantine. The localities and explanation, look under the trophy "Purity of Power". Angelic Artifacts and Demonic Artifacts are found as shiny objects in the environment. Mostly they can be found in corpses and in hidden passages as orange luminous objects. Explore all areas carefully. Alternatively, Vulgrim (the dealer) sells them in his deal with souls. For each enhancement, you need a Invigoration Core. Here we show you all places where you can find them. You can not miss this trophy, you can find a video guide to the first boss here. Defeat Wrath in The Nether and the Flame Hollow will be obtained after a few cutscenes. Automatic story-related trophy, cannot be missed. Unlocks after beating the boss “Lust”. Where you can find the Humans you see under the trophy Humanitarian. Obtain 1 Rejuvenation Core after green mini boss bug enemy in The Nether. Look at the trophy “Unbreakable Will”. Sliver, Fragments, and Pieces of Adamantine are crafting materials, to upgrade Fury’s weapons. These can be found as shiny objects in the environment as well as items enemies drop after being defeated. Vulgrim will sell them in his shop at various times with limited quantities until the endgame where he will have an infinite supply. There are only three of these chunks in the game, you need them to perfect your weapon. Here we explain everything to you and show you all locations. Kill Abraxis and spare the prince, how to get the mysterious relic you can read here.